The history of the Chrysler Corporation is a story much like many of the other automakers except that it was a joint venture that consisted of engineers. Walter P. Chrysler formed the Chrysler Corporation with 3 other engineers in 1925. He bought out the struggling Maxwell Motor Corporation of Detroit and had a place to start building his vision of well-engineered automobiles. It would be nice to own the Chrysler brochures of the early years. Then in 1928 the Chrysler Corporation expand its holdings by acquiring the Dodge Motor Company and forming the Plymouth and DeSoto divisions of Chrysler. Engineering was the focus of this new automaker and it quickly earned a reputation for finely built automobiles. In an effort to make a big name for the Chrysler Corporation they introduced a model known as the Airflow. The car was aerodynamically designed (a first I the industry) and sported a front straight eight-cylinder engine. It consisted of sharp lines and bold amenities. However the Airflow did not make any waves with the car buying public. That would be great Chrysler sales brochure to own. Like all automakers the depression was a tough time to be in business, but Chrysler weathered the storm with their lower priced lines and models of Dodge and Plymouth. After the war Chrysler started doing big things and turning heads with their vehicles. There were even years when Chrysler outsold Ford to take the number two spot behind the massive General Motors. 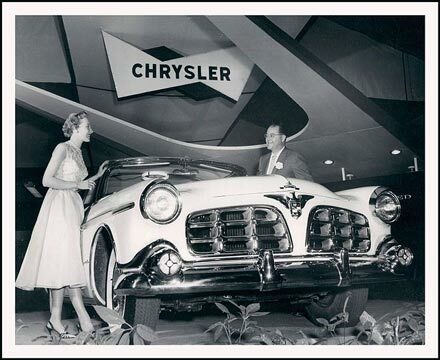 Chrysler had its sites set on Cadillac as the brand to beat and in 1951 they introduced the legendary V8 Hemi Engine. This powerful engine was 180 horsepower and even bigger than their current V8 engine that offered 135 horsepower. This was the power plant that Chrysler developed to overtake Cadillac and their V8 engine. That brings the 1950s and 1960s and the race was on. Chrysler introduced the 300C and Town and Country (Chrysler brochures below); models still being built today however they have changed significantly. These top-selling vehicles made a name for the Chrysler Corporation that is still seen today. In the early 1960s Chrysler streamlined and dropped the DeSoto brand. Sorry no Chrysler sales literature that include DeSoto. Engineering was becoming a more important part of auto manufacturing and Chrysler had the knowledge and experience in this area. Technology was becoming part of auto making and Chrysler didn’t take a back seat. They were responsible for replacing the generator with an alternator (still used today) and unibody construction, which has become very popular. Chrysler was creating a name for itself on the NASCAR track by producing performance automobiles. When the 1970s rolled around things started changing in the auto industry. These things were trigger by the oil crisis, government regulations, the car buying public. However this created some tough times for the Chrysler Corporation and in the late 1970s Chrysler went to the federal government for loan guarantees to borrow 1.5 billion dollars to keep the company from filing bankruptcy. Which was very much like some of the other automakers in 2009 and 2010. A new face came to the rescue of Chrysler when Lee Iacocca became chairman of the company. He was a great public relations ambassador and introduced the K-car along with the minivan that Chrysler really pioneered single handed. This put Chrysler back on track and you could even see the well-known and liked chairman featured in TV commercials and Chrysler brochures. Chrysler did so well that they even paid off the government-backed loans seven years early. Things were looking up Chrysler and in the late 1980s they purchased America Motors, which included the Jeep badge. They also created a joint venture Mitsubishi Motors and created Diamond Star Motors seen in some Chrysler car brochures. Chrysler sales continued to move forward through the rest of the 1980s and most of the 1990s and in 1998 Chrysler merged with Daimler-Benz. Outsiders considered it a merger at the time but it was soon clear that Daimler rather Chrysler controlled Daimler Chrysler. Then in 2007 Daimler saw the writing on the wall and sold the Chrysler Corporation to a private equity company. The shining star of this whole mess was the very popular 300 model which is still in the line-up today see the Chrysler brochures and sales literature below. Then only a few years later the recession hit of 2008 and 2009 and the auto industry took a huge hit and once again Chrysler was knocking on the door on the government for money along General Motors. Before the whole mess was cleaned up and back and running the powerful Italian automaker Fiat took over the helm and you can see that influence in the Chrysler brochures of their cars and Dodge trucks. Today Chrysler is not the name that it once was. 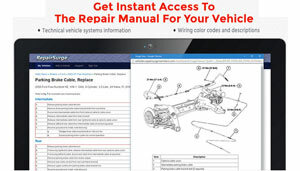 The Chrysler offerings in 2015 consist of 2 cars and a minivan plus the Dodge brand know mostly for their trucks and performance cars. You can check out the Chrysler brochures of today and several years in the past below.